ORP is coordinating the Oyster Best Management Practice (BMP) Expert Panel following the Chesapeake Bay Program (CBP) Partnership’s BMP Expert Panel Review Protocol. The Panel is charged to provide recommendations on and to apply a decision framework to quantify the nutrient (nitrogen and phosphorus) and suspended sediment reduction effectiveness of oyster practices, including aquaculture and restoration activities, where there is sufficient science, for BMP application in the Chesapeake Bay Total Maximum Daily Load (TMDL). The Chesapeake Bay TMDL is a pollutant clean-up plan for the Bay and its tributaries that was finalized by EPA in 2010 and sets limits for the amount of nutrients and sediment that can enter the Bay by each jurisdiction in order to restore it to healthy levels. Excess nutrients (nitrogen and phosphorus) and sediment from human activities negatively affect water quality by disrupting the balance needed to support a healthy ecosystem. Science has shown that oysters can play a role in restoring water quality because of their filter-feeding capabilities. Through filter-feeding, oysters remove nutrients from the water by consuming and assimilating the nitrogen and phosphorus from what they eat (algae, for the most part) into their tissue and shells. Oysters also enhance nutrient reduction by depositing digested or undigested organic particles on the bottom making it more accessible to bacteria that convert bioavailable nitrogen to nitrogen gas via denitrification and increasing the opportunity for the nitrogen and phosphorus in the organic particles to be buried in the bottom sediment. Nitrogen gas is not a bioavailable form of nitrogen and therefore, does not promote the growth of excess organic matter. The nitrogen gas is eventually released into the atmosphere removing it from the water. Oysters also remove sediment particles from the water column during filter-feeding by depositing them on the bottom, which helps clear the water. The CBP’s Water Quality Goal Implementation Team, in coordination with the CBP Partnership, approved the Panel’s membership on September 14, 2015. Jeff Cornwell, from the University of Maryland Center for Environmental Science (UMCES), was selected and accepted to chair the Panel. The Panel includes oyster scientists and practitioners from the East Coast region, including representatives from academia, non-profit organizations, and county, state, and federal agencies who have expertise in oyster biology/ecology, water quality, fishery management, and/or oyster practice implementation. Panel Chair Jeff Cornwell leads discussion during the Oyster BMP Expert Panel Public Stakeholder meeting. The Panel is following the CBP Partnership’s BMP Expert Panel Review Protocol. The Panel is meeting monthly from September 2015 to September 2017. Per the protocol, panel meetings are closed except for the public stakeholder meeting, which is an opportunity for the public to present data and/or information for the panelists to consider. The Panel will review all relevant available data to develop a report that will include recommendations on the nutrient and suspended sediment reduction effectiveness of oyster practices and guidelines on how the reduction could be applied and verified for application in the Chesapeake Bay TMDL. All panel recommendations will undergo a public review period where the Panel will respond to comments. Final recommendations will be approved by the CBP Water Quality Goal Implementation Team (WQGIT), in coordination with the Sustainable Fisheries and Habitat GITs. Once approved, the oyster practice and any corresponding nutrient and suspended sediment reduction effectiveness crediting protocols can be selected as an approved BMP by jurisdictions (State and local governments) to help meet the water quality goals established by the Chesapeake Bay TMDL. The Panel will provide regular updates to the CBP Partnership (see Upcoming Panel Updates below). These updates are open to the public. First Report: Panel Recommendations on the Oyster BMP Nutrient and Suspended Sediment Reduction Effectiveness Determination Decision Framework and Nitrogen and Phosphorus Assimilation in Oyster Tissue Reduction Effectiveness for Oyster Aquaculture Practices. April 13, 2015—ORP presented rationale for convening an Oyster BMP Expert Panel during the CBP’s WQGIT meeting. The WQGIT approved ORP to convene and coordinate the Oyster BMP Expert Panel. Meeting materials and minutes are located here. September 14, 2015—The CBP’s WQGIT approved the Panel’s membership and charge. Meeting materials and minutes are located here. September 30, 2015—The Panel convened its first meeting. November 2, 2015—The Panel hosted its public stakeholder meeting. Around 60 people participated, including 5 stakeholder groups presenting information related to how oyster practices could be implemented as BMPs to reduce nutrient pollution. More information on the public stakeholder meeting can be found on the CBP calendar webpage. February 8, 2016—The Panel updated the Chesapeake Bay Program on the draft Oyster BMP Nutrient and Suspended Sediment Reduction Effectiveness Decision Framework during the WQGIT meeting. The briefing materials and presentation can be found here. April 25, 2016—During the WQGIT meeting, the Panel updated the Chesapeake Bay Program Partnership on their responses to public comments concerning the draft Oyster BMP Nutrient and Suspended Sediment Reduction Effectiveness Decision Framework and status of the Panel’s data review. The responses to comments and presentation can be found here. June 15, 2016—Special CBP Partnership Management Board meeting to provide policy recommendations on issues raised by the Oyster BMP Expert Panel and stakeholders. Meeting materials and decisions can be found here. September 1, 2016—The Panel presented their draft technical appendix on the technical requirements for reporting and simulating oyster aquaculture BMPs in the Phase 6 Watershed Model to the Watershed Technical Workgroup for initial input. Presentation and materials can be found here. 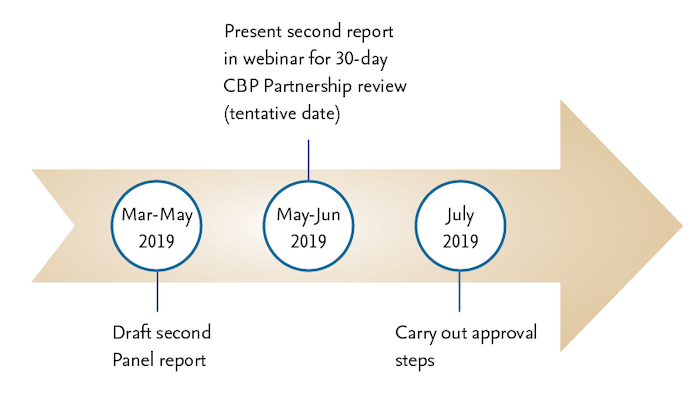 September 22, 2016—Webinar debuting the Panel’s 1st incremental recommendation draft report followed by a 30-day review and comment period for the CBP Partnership and public. The webinar and report can be found here on the CBP calendar webpage. November 28, 2016—The Panel’s update to the WQGIT on their responses to comments from the CBP Partnership and interested parties on the draft of their first report. Meeting materials, including the Panel’s responses to comments document, are posted here. December 1, 2016—The Watershed Technical Workgroup approved the Panel’s technical appendix on the technical requirements for reporting and simulating private oyster aquaculture BMPs in the Phase 6 Watershed Model. Materials are posted here. December 19, 2016—The WGQIT, in coordination with the Sustainable Fisheries and Habitat GITS, approved the Panel’s first report. The report and presentation are posted here. May 8, 2017– The Panel updated the WQGIT on the Panel’s progress related to the nitrogen and phosphorus assimilation in oyster shell and enhanced denitrification crediting protocols for oyster aquaculture and/or restoration practices based on their review of the science. The presentation and meeting materials are located here. May 22, 2017– The Panel hosted an open feedback meeting to solicit early feedback from interested parties on the Panel’s recommendations being developed for the nitrogen and phosphorus assimilation in oyster shell and enhanced denitrification crediting protocols related to oyster aquaculture and/or restoration practices. Materials and summaries from the meeting can be found here. A framework to determine the potential nitrogen and phosphorus reduction effectiveness associated with shell from harvested oysters for BMP consideration. Site-specific methodologies to determine the nitrogen reduction effectiveness related to the enhanced denitrification protocol for oyster reef restoration and private oyster aquaculture practices. The presentation and meeting materials are located here. February 1, 2018– The Panel provided a written update to the CBP Partnership summarizing the oyster practice-nutrient reduction effectiveness protocols that will be covered in the second report. The Panel is submitting incremental recommendations for CBP Partnership review and approval. The Panel will continue to meet through 2019 to develop their second set of recommendations.